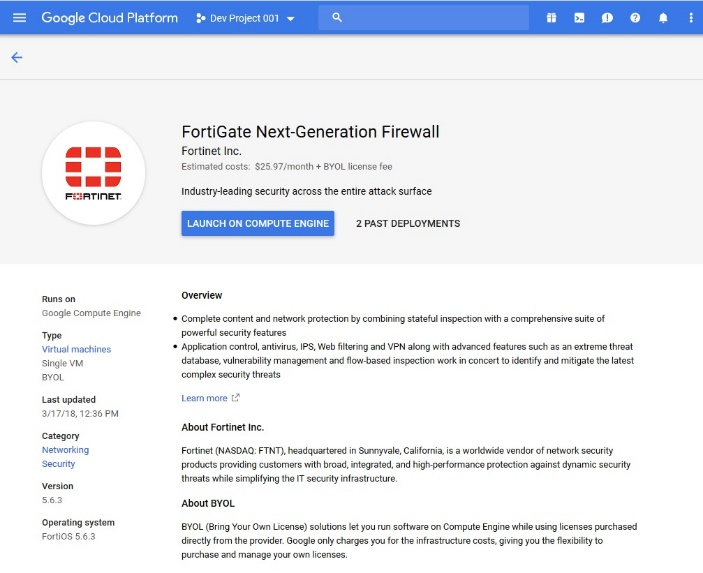 In the Google Cloud marketplace Cloud Launcher, find FortiGate Next-Generation Firewall. This deployment method assigns only one network interface to the VM instance. With this deployment method, you cannot change the number of network interfaces after VM deployment. To assign multiple network interfaces, perform a manual deployment using Compute Engine or the Google Cloud SDK. 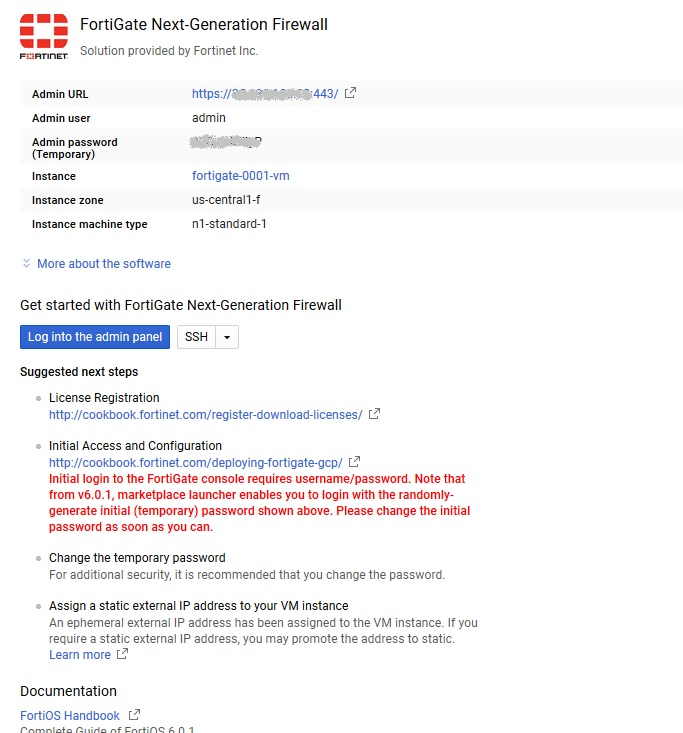 Enter the FortiGate-VM name to appear in the Compute Engine portal. Choose the zone to deploy the FortiGate to. Choose the instance type required. Choose the desired boot disk type. Leave as-is at 10 GB. Select the network located in the selected zone. Select the subnet where the FortiGate resides. Currently a one-arm setup in one subnet is supported on the Cloud Launcher solution. Leave all selected as shown, or allow at least HTTPS if the strictest security is allowed in your network as the first setup. Change firewall settings as needed later on. 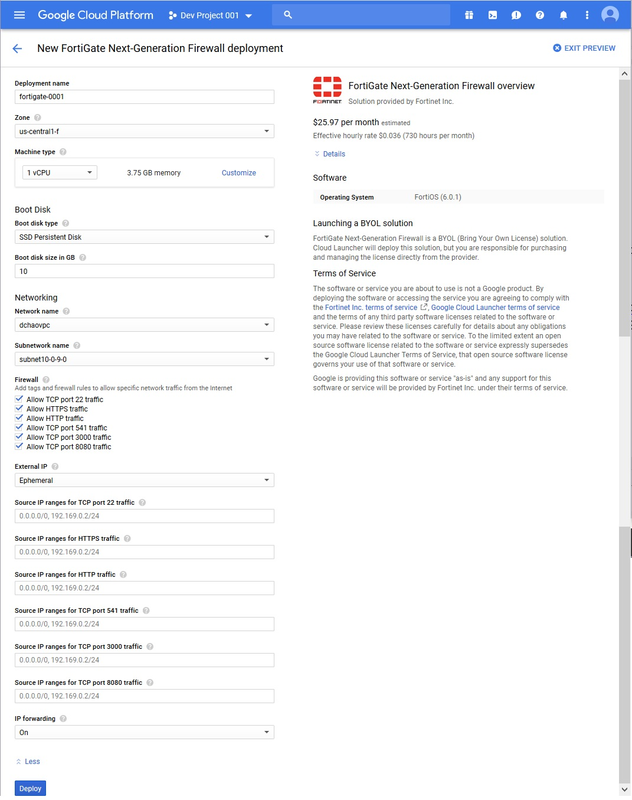 These are the open ports allowed in Google Cloud to protect incoming access to the FortiGate instance over the Internet and are not part of FortiGate firewall features. Select Ephemeral. You will need to access the FortiGate management GUI via this public IP address. Leave the other options as shown. Click Deploy. When deployment is done, the screen appears as below.